Northern Virginia residential snow removal is a key business decision for homeowners who require a residential snow removal contract. Complete Lawn Services will help take care of your residential snow removal in Northern Virginia. 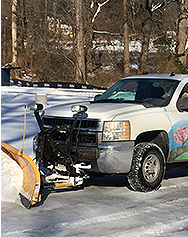 As a top company in northern Virginia residential snow removal, Complete Lawn Services provides numerous types of residential snow removal contract services. We will simplify your residential snow removal in Northern Virginia. Northern Virginia residential snow removal is an area of expertise for Complete Lawn Services. Call us immediately for pricing on a residential snow removal contract and your worries about residential snow removal in Northern Virginia will be assuaged. In an around Alexandria, Virginal we only average about 7.2 inches of snow annually, but the Wintery mix of snow, sleet, hail and freezing rain can be much more devastating than heavy snow accumulation. Homeowners trust us to keep them open, safe and accessible during wintry weather. When the weather gets cold, do you find yourself living in fear of that first snowfall? Do you dread putting on your heavy boots, hauling out the shovel and sweating under your thick winter coat? Our snow removal service is here to calm your fears! Our crews show up and give you access to the outside world. Often when you wake up your property is clean and the ice is melting. Posted December 27, 2015 & filed under Northern Virginia residential snow removal.